Spiritual rebirth (From water and spirit) - The end of the first of the seven big initiations. We see here also the angel who prophesizes the birth of the divine child. 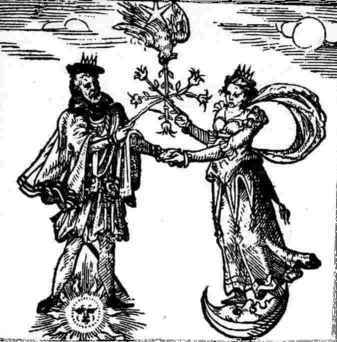 He poors the white lunar forces into the golden solar jug. His heartforces are divinized. The human has no more nutrient. 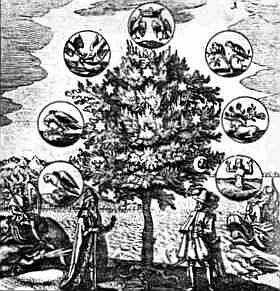 Tree of life (Philosophia reformata // Basilius Valentius - Azoth, Paris, 1659) with the 7 steps.